-Willie Monroe beats Javier Maciel, Jeison Rosario outpoints Jamontay Clark and Jamal James stops Mahonry Montes in Minneapolis and a bizarre happening sees Curtis Harper climb out of the ring and back to the dressing rooms as the bell sounds to start the first round of his fight with Efe Ajagba giving Ajagba a fastest ever 0:01 second win. Glendale, AZ, USA: Light: Jose Pedraza (25-1) W PTS 12 Ray Beltran (35-8-1,1ND). Super Bantam: Isaac Dogboe (20-0) W TKO 1 Hidenori Otake (31-3-3). Pedraza outpoints Beltran to win the WBO title and become a two-division champion. The opening round saw Beltran prowling after a cautious Pedraza. The challenger was slotting home jabs and short rights. Beltran was padding after Pedraza but when he tried to move inside Pedraza was tying him up. Beltran attacked harder in the second but it was Pedraza’s round. He switched to southpaw and continually found gaps for his jab. He also landed sharp counters and a right opened a cut over the left eye of Beltran. The third was closer. Beltran managed to get inside more and landed some good body punches but still had no answer to Pedraza’s jab. The four saw Beltran up the pressure again going to the body. Pedraza used the jab less but was exhibiting some clever defensive work. After four rounds the scores were 38-38 twice and 39-37 for Pedraza. It was a case of role reversal in the fifth. Pedraza went back to orthodox and Beltran went onto the back foot and fired jabs. It didn’t work too well for the champion as Pedraza had faster hands and finished the round scoring with a sequence of jabs and hooks. Pedraza changed tactics completely in the sixth. He spent the whole round in close forcing Beltran to the ropes and trying to keep him there. Perhaps he was trying to wear down the older man but it was not a smart tactic as his jab had been his best weapon but he ignored and Beltran was the one doing most of the scoring. The seventh was the best round so far. Beltran was back to storming attacks going to the body with Pedraza reverting to southpaw and stabbing home hurtful jabs and scoring with hooks inside and just doing enough to take the round. The eighth was Pedraza’s. He was finding the target with his jab throughout the round and scoring with long lefts and hooks inside. Beltran just could not land anything of substance. After eight rounds the scores were 77-75 twice for Pedraza and 76-76. Pedraza simply outboxed Beltran in the ninth and tenth. He kept popping Beltran with the jab and scoring with long rights and sneaky hooks inside. Beltran was finding it hard to hit the target with Pedraza ducking, bobbing and weaving cleverly and Beltran’s work was ragged. Beltran must have known his title was slipping away so he attacked strongly in the eleventh. With a minute to go in the round Beltran walked onto a perfect left hook the put him on the floor. He was up at five and when the action recommenced he was pinned to the ropes as Pedraza banged away looking to finish things but Beltran was able to make it to the bell. Beltran needed a knockout but instead Pedraza kept him on the end of his jab for most of the round and then pinned Beltran in the corner and was landing with a whole series of head punches with the referee even looking as if he might stop the fight but then the bell went. Scores 117-110 twice and 115-112 all for Pedraza. The 29-year-old Puerto Rican “Sniper” becomes a two-division champion. As IBF champion he won the title against Andrey Klimov and then impressed in defences against Edner Cherry and Steven Smith before being floored and stopped by Gervonta Davis in January 2017. That title loss caused a lot of soul searching and it was 14 months before he fought again scoring a win in March this year. With Vasyl Lomachenko and Mikey Garcia holding the other titles Pedraza is going to have a tough time if he intends to unify the titles and he may even be forced to fight the WBO No 1 Roman Andreev next. At 37 this may be the last hurrah for the gutsy Beltran. His road to the title had some bumps along the way. He looked unlucky to only get a draw with Ricky Burns for the WBO title in 2013 and then lost against Terrence Crawford in his second attempt at the WBO title. The third attempt saw him stop Takahiro Ao but he both failed to make the weight and tested positive for a banned substance. That put him on the sidelines for a year but a run of good wins finally saw him win the WBO title by outpointing Paulus Moses in February. A long way to the top and such a short time up there. A quick start and a quick finish in this one as Dogboe crushes Otake inside a round to retain the WBO title. Within the first ten seconds Dogboe was throwing some sharp uppercuts with Otake banging to the body. Dogboe landed a top quality left hook/left uppercut combination and then a left to the head wobbled Otake. He recovered quickly and they traded body punches. Otake was still looking unsteady and a powerful jab rocked him. Suddenly Dogboe powered inside with a left uppercut to the chin that sent Otake back and down. He was up quickly and after the eight count tried to take the fight to Dogboe but was caught by three left hooks and a heavy right that saw him stumble and touch the canvas with both gloves. He was given an eight count but when the action resumed Dogboe landed some head punches and every one of them had Otake wobbling and the referee stepped in and stopped the fight. The 23-year-old “Brave Son” showed impressive speed and power here just as he had in beating Jesse Magdaleno for the WBO title in April. He says that he now wants to unify the super bantam titles and is aiming for a fight with Rey Vargas. His No 1 challenger in the WBO listings is Diego De la Hoya but that would require a deal between Top Rank and Golden Boy. The 37-year-old Otake had gone the distance in losing to Scott Quigg for the secondary WBA title and this is the first time Otake has lost by KO/TKO which makes Dogboe’s performance even more impressive. Otake goes back to working as a Chef for the Yokohama Beer Company and says he intends to keep fighting. Panama City, Panama: Feather: Bryan De Gracia (24-1-1) W TKO 4 Edinso Torres (10-1). Super Feather: Francisco Fonseca (22-1-1) W TKO 5 Sandro Hernandez (14-4-3). Super Feather: Jaime Arboleda (13-1) W RTD 3 Kenin Betancourt (8-1). “The Rock” De Gracia much too good for over-matched Venezuelan novice Torres. The Panamanian was chasing down the fleet-footed Torres and he caught up with him in the second. Torres was circling the perimeter of the ring with De Gracia stalking after him. The Venezuelan’s punches had no power in them and De Gracia caught Torres on the ropes just before the bell and landed two body punches which dropped Torres on his knees. He beat the count and the bell went before De Gracia could finish things. In the fourth De Gracia was again stalking Torres and another body punch set Torres down on his haunches. He was up at eight and had spat out his mouthguard. The referee picked it and tossed it to the Venezuelan’s second but also signalled for the fight to continue. Both fighters were surprised by this and although they both started towards each other the referee stopped the fight before a punch was landed and replaced the Venezuelan’s mouthguard, which he should have done in the first place, De Gracia was chasing down Torres and throwing some wild rights. He looked to have landed a left that put Torres down but it was ruled a slip. De Gracia took Torres to the ropes and threw another body punch which just seemed to brush past the stomach of Torres but he went down and the referee waived the fight over. The 24-year-old local has 20 wins by KO/TK He was 20-0-1 and on the way to a title fight until he suffered a shock points loss to local rival Jorge Sanchez. This is his fourth win by KO/TKO since then, He has dropped in the ratings to WBA 9/WBC 11/IBF 13(11) but hopes to challenge Jesus Rojas for the secondary WBA title next year. Don’t be fooled by the ten wins of 20-year-old Torres. His ten victims had only ten wins between them. Costa Rican Fonseca retains the WBO Latino title with stoppage of Hernandez. This was a one-sided fight with the taller Hernandez game enough but lacking the power or punch to ever threaten Fonseca. Round –by-round Fonseca broke Hernandez down. In the fifth a right drove Hernandez into the ropes. He slid along trying to get out of trouble but after another right he dropped forward to his hands and knees. He made it to his feet but indicated he did not want to continue and the fight was over. Fonseca challenged Gervonta Davis for the IBF title in August last year. Davis failed to make the weight but knocked out Fonseca in eight rounds. The 24-year-old Fonseca makes it 16 wins by KO/TKO. He was making the first defence of the WBO Latino title. He is rated No 12 by the WBO. He comes from a boxing family. Oldest brother Jose retired in 2008 and second eldest Freddy fought and won in Nicaragua on Saturday. Hernandez was 3-0-1 in previous fights this year. The 5’11” (180cm) Arboleda had lots of height and reach over Venezuelan Betancourt. Arboleda worked well with his jab as an aggressive Betancourt tried to walk his way inside. There were some fiery exchanges in each round with Betancourt going to the body and Arboleda scoring with some strong straight rights. In the third Arboleda was dominating the action. He was driving Betancourt around the ring mixing left hooks to the body with powerful rights and opening a cut over the visitor’s right eye with a punch. Betancourt tried to punch back but was taking some fearsome punishment at the bell. Betancourt then retired due to the severity of the cut. The 23-year-old Arboleda was a star of the Panamanian amateur team winning gold medals at the Pan American and the Central American Championships but in his eleventh pro fight in July last year lost on a third round kayo against Filipino Recky Dulay. It is now three wins in a row all inside three rounds for Arboleda. Betancourt, who is based in Panama, was also a member of his National amateur team. Minneapolis. MN, USA: Middle: Willie Monroe Jr (23-3) W PTS 10 Javier Maciel (33-7). Super Welter: Jeison Rosario (16-1-1) W PTS 10 Jamontay Clark (13-1). Welter: Jamal James (24-1) W KO 2 Mahonry Montes (35-8-1). Super Middle: Caleb Truax (30-4-2) W TKO 3 Fabiano Pena (15-11-1). Super Welter: Sebastian Fundora (10-0) W TKO 4 Antonio Urista (10-3). Bantam: Gary Antonio Russell (12-0) W KO 1 Nick Otieno (31-15). Heavy: Efe Ajagba (6-0) W DISQ 1 Curtis Harper (13-6).Welter: Eimantas Stanionis (7-0) W PTS 8 PTS 8 Levan Ghvamichava (18-4). Monroe much too skilled and too quick for the one-paced Maciel. Monroe won the first round using his better skills to keep the aggressive Maciel out and countering well. Maciel had a much better second round forcing harder and landing a couple of good punches. There was plenty of back-and-fourth action in the third with Monroe digging to the body. Maciel trapped Monroe on the ropes but Monroe’s good defensive work nullified most of Maciel efforts. The fourth was close with Monroe not working hard enough but he dominated the fifth and sixth scoring to head and body and bobbing and weaving smartly with Maciel off target. The seventh and eighth followed the same pattern. Monroe was slotting home southpaw jabs and firing rapid combinations with Maciel too slow to counter. Maciel slowed over the last two rounds and Monroe was landing some quick hooks and uppercuts as he breezed to victory, Scores 100-90 twice and 99-91 for Monroe. The 31-year-old “Mongoose” was having hid second fight since losing to Billy Joe Saunders in a challenge for the WBO title in September. Unfortunately although Monroe has plenty of skill his fights are rarely entertaining and this one was too one-sided. Monroe threw out a challenge to WBC champion Jermall Charlo who was working at ringside as one of the commentating team. Maciel, 33, is strong, brave and limited. He had a title shot way back in 2011 when he lost to Dmitry Pirog for the WBO title. This looked a risky fight for unbeaten southpaw Clark and so it proved. It was an interesting but uneventful fight over the first two rounds but livened up in the third. As they traded shots a punch from Rosario sent Clark careering across the ring then down and out through the ropes and onto the ringside tables and then the floor. He dusted himself off and climbed back into the ring inside the 20 second time allowed. It seemed that the fall shook some of Clark’s confidence and he was never really in the fight after that. Rosario controlled much of the action with his strong jab and hard rights with Clark unable to turn things around. In the seventh a right from Rosario again sent Clark careering across the ring head first but this time he ran up against the corner post so stayed in the ring. Rosario shook him with a neck-snapping right and Clark was hurt and disorganised. Rosario staged a strong finish in the tenth and took the decision. Scores 99-90, 98-91 and 97-92 all for Dominican “Banana” Rosario. After ten wins in a row Rosario suffered a heavy defeat when he was floored and stopped by Nathaniel Gallimore in April last year. He struggled through a couple of routine wins and a draw but got back in the picture in May this year with a win over Justin DeLoach. Clark, 23, had a good year in 2017 getting an upset win over unbeaten Ivan Golub and edging out Domonique Dolton so this is a major set-back, Can’t help but feel that at 6’2” he would be better to move up to middle and build some power. James crushes Montes in two rounds. James was landing rib bending shots on Montes in the first but the Mexican kept marching forward trying to work inside. James continued score heavily in the second. Montes tried to walk through the punishment but was nailed with two chopping rights and then walked into right after right until a left to the body dropped him on his hands and knees with his head resting on the canvas. The referee started the count but Montes fell over rolling in pain and the referee waived the fight off. The 30-year-old 6’2” (188cm) local goes to eleven wins by KO/TKO. He turned pro in 2010 and spent most of his early career fighting under the radar in Minneapolis. Hr finally broke through in 2015/2016 with wins over Juan Carlos Abregu, Javier Molina and Wale Omotoso but suffered a set-back in August 2016 when he lost a decision to Yordenis Ugas. He has rebuilt from there with wins over Ionut Dan Ion, Diego Chaves and Abel Ramos and is rated WBA 3/WBC 11 but he is in a tough division with lots of big names being thrown around. Mexican Montes made a great start being 25-0-1 at one time but the higher you climb the tougher the road gets and he has had losses to good quality opposition including Ashley Theophane and Egidijus Kavaliauskas. Truax gets back into the ring for the first time since losing the IBF title to James De Gale in April and steamrollers Brazilian Pena. Truax is a good few classes above Pena and soon established a strong accurate jab and mixed in some choice uppercuts. He continued the punishment in the second adding some crisp straight rights as Pena began to wilt. In the third it was one-way traffic asTruax landed with heavy rights forcing Pena around the ring. He took Pena to the ropes and landed a vicious uppercut and some hooks to the body. Pena pushed off the ropes but was battered back and a booming uppercut dumped him on the floor. Pena got up quickly and started to walk towards a neutral corner the referee stopped him and had a hard look at him then waived the fight off. The 34-year-old neighbourhood fighter Truax has 19 wins by KO/TKO. All of the super middle champions are booked at this time but as he is rated IBF 7(7)/WBC 10 a shot next year is a possibility. Now ten losses by KO/TKO for brittle-chinned Mexican-based Pena. “The Towering Inferno” gets another victim. The 6’6” (198cm) Fundora engaged in some entertaining exchanges against Urista. The taller man was able to score regularly with his long southpaw jab and mixed in plenty of thudding rights. Urista fought back hard over the first two rounds but was being caught with uppercuts and hooks in the third and taking too much punishment in the fourth and the fight was stopped. Now six wins by KO/TKO for the 20-year-old from California. Michigan’s Urista had won 5 of his last 6 fights and this is his first loss by KO/TKO. Russell obliterates Kenyan oldie Otieno. Russell was all over Otieno from the start. Otieno tried to smother Russell’s attacks by coming inside and holding but Russell drilled him with two southpaw lefts that put Otieno down and out after just 78 seconds. Gary Anthony Russell, 25, is one of the Russell clan who were all given the Christian name of Gary with Gary Jr being the WBC feather champion and Gary Antuanne an unbeaten super light. This Gary has ten wins by KO/TKO. He was National Golden Gloves champion in 2013. He also won silver medals at the Gloves in 2010 and 2014 and was also a National Police Athletic League Tournament winner. Otieno, 44, was a WBC International and ABU champion way back but it is just cannon fodder now. A bizarre happening sees Nigerian Ajagba set a record for the quickest win a record that can never be beaten. Ajagba was ready to fight Harper and they had shaken hands and gone back to their corners. When the bell rang as Ajagba took a couple of steps forward Harper simply stepped out through the ropes and walked away to the dressing rooms prompting his disqualification after just one second! It appears that Harper was very unhappy about the money he was being paid and this was his version of a protest. Disappointing for Ajagba. Harper won’t get paid but will almost certainly get a fine and a suspension so not a smart move on his part. Glasgow, Scotland: Super Light: Chris Jenkins (19-3-2) TEC DRAW 3 Darragh Foley (15-2-1). Light: Stephen Ormond (26-5) W PTS 10 George Ashie (28-5-2). Super Middle: Dave Brophy (20-2-1) W TKO 5 Norbert Szekeres (18-68-3). Super Feather: David Oliver Joyce (8-0) W TKO 6 Arturo Lopez (5-5-3). Super Welter: Kieran Smith (11-0) W PTS 6 Miguel Aguilar (11-47-1). What looked like being a hugely entertaining contest came to a disappointing end due to a cut. Jenkins seemed to just edge the first two close rounds but a clash of heads resulted in a serious cut over the right eye of the Welsh fighter and the ringside doctor advised the fight be stopped after the end of the third round making it a technical draw. Southpaw Foley retains the WBA Oceania title. Although born in Kent, England, he had done all of his fighting in Australia and this was a disappointing ending for his first fight in the UK. Cuts have haunted the career of Jenkins. He was cut when drawing and losing against Tyrone Nurse for the British title and again in losing fights against Phillip Sutcliffe and Akeem Ennis Brown. This was an attractive match on paper so hopefully they will fight again and you again will get a Welshman fighting in the UK for an Oceania title! Ormond needs a late knockdown to take a one point win over unlucky Ashie. This was a tough, hard fought scrap all the way. Ashie showed improvement from when he challenged for the Commonwealth title back in 2006 and then won the title in 2012.It looked as though he had done enough to assure victory when he floored Ormond in the eighth but Ormond is a battler and he had Ashie on the floor for a flash knockdown in the ninth which gave him the win. Referee’s score 95-94. The 35-year-old Irish “Rock” Gets his second win as he works his way back after consecutive losses in 2017 to Craig Evans and on a split decision to Paul Hyland Jr. Ashie, 15 years a pro, lost on points to Kevin Mitchell for the Commonwealth title in that 2006 fight. He has fought sporadically recently as this is only his sixth fight in almost six years. First fight in ten months for former Commonwealth champion Brophy. Hungarian Szekeres hung in there for four rounds without really troubling the Scot and was halted in the fifth. Brophy put up a great display in beating Zac Dunn in Australia in March last year but lost the title on a first round stoppage against Rocky Fielding in September. Szekeres drops to 21 losses in a row. He came in as a late substitute as he often does. Joyce had been lined up for a stern test against Scot Ronny Clark but Clark dropped out injured and Mexican Lopez was called in as a very late replacement. Joyce was not happy about losing the chance for a bigger fight so he handed out severe punishment to poor Lopez until the fight was stopped in the sixth round. Irishman Joyce had a long and very successful time as an amateur so has left it late only turning pro at 31. He was twice European Union champion and competed at the 2009 and 2011 World Championships and the 2016 Olympic Games. Lopez is 0-4-2 in his last six fights. Corona, CA, USA: Feather: Ruben Villa (13-0) W PTS 8 Jose Santos Gonzalez (23-6). Bantam: Saul Sanchez (10-0) W KO 4 Ernesto Guerrero (29-24). Villa outpoints tough Mexican Gonzalez. After a slow start Villa used his better skills and faster movement to outbox and outscore Gonzalez. A punch from Villa opened a cut over the right eye of Gonzalez in the second but despite that Gonzalez continued to press with crude lunging attacks. He was able to do some effective work when he got inside but it was Villa who was landing more, harder and accurate punches. Villa increased his pace over the closing rounds looking for a stoppage but Gonzalez showed a good chin and was still there at the final bell. Scores 79-73 twice and 80-72 for Villa. The 21-year-old Salinas southpaw is making good progress. No names yet but as an amateur he beat Shakur Stevenson twice in 2015 before losing to Stevenson twice in 2016 which earned Stevenson victory at the US Olympic Trials. “Little Bull” Gonzalez has lost 4 of his last 5 fights but the other three losses were against good opposition comprising unbeaten South African Mzuvukile Magwaca and Zolani Tete and a loss to Duke Micah on majority decision in November. Sanchez wears down and stops Guerrero in four. Sanchez used a focused body attack to erode Guerrero’s will over the first three rounds. In the fourth an already tiring Guerrero tried to stay in close but Sanchez pushed him off and a right and two left hooks sent Guerrero back and a pile-driver of a right to the body saw Guerrero falling back and down halfway out under the bottom rope. The referee started to count but saw Guerrero was not going to get up and just waived the fight over. Impressive win for 21-year-old Sanchez in what was his first fight scheduled for eight rounds and against a much more experienced opponent. Guerrero had taken Villa the distance in September. Tres Arroyos, Argentina: Light: Gustavo Lemos (18-0) W TKO 4 Nestor Armas (18-3). Lemos marches on with stoppage of Venezuelan Armas. Although much the taller man Armas could not match the aggression or punch of the home town fighter. Just thirty seconds into the fight a heavy left from Lemos saw Armas drop to his knees. He beat the count but Lemos piled on the pressure in the second round and for most of the third. Armas had his only success when a left counter shook Lemos. It was all over in the fourth. Lemos hurt Armas with a right to the head and then forced him into a corner. Lemos just rained punches on Armas and with the Venezuelan not throwing anything back the referee stopped the fight. The 22-year-old “Electric” Lemos, the Argentinian No 2, was defending the IBF Latino title for the third time. After losing his first amateur fight he then won the remaining 34 but he has to be able to fight-he has nine brothers! Another bad night for a Venezuelan boxer and another misleading record. Of his 18 victims 15 of them had never won a fight and the 18 had only five wins in total. Shenzhen, China: Fly: Wenfeng Ge (11-0) W PTS 12 Ivan Soriano (18-2-1). Super Middle: Ahatelike Muerzhableke (8-1-1) W TKO 6 Chaloemporn (18-6). Good win for world rated Ge as he takes unanimous decision over useful Filipino Soriano. Ge was much the bigger man at 5’ 6 ½” (169cm) and a natural flyweight whereas Soriano is the No 1 in Philippines ratings at light flyweight. Ge forced the pace from the outset and Soriano found himself fighting on the back foot for much of the fight. Ge had a big fourth with Soriano having to absorb plenty of punishment but he did and kept trying to fire back. Ge showed some flaws in his defensive work but dominated the first half of the fight. Soriano came into it more as Ge began to tire from the frantic pace he had set and Soriano rocked the Chinese fighter with a right in the seventh. The Filipino had Ge hurt again in the tenth but Ge had already built a winning lead and he found something extra to see him through the last two rounds. Scores 117-111 twice and 116-112 for Ge. The 31-year-old Ge wins the vacant WBO International title. He had a big win in November when he outpointed former IBF champion Amnat Ruenroeng and gained some revenge for China as the Thai had beaten national hero Shiming Zou in an IBF title defence in 2015. He is now hoping for a shot at WBO champion Sho Kimura but will have to tighten his defence before then. Soriano was a genuine test being unbeaten in his last 15 fights but Ge was just too big for him. Another case of the big man beating the little one as the 5’11 ½” (182) Muerzhableke beats the 5’6” (168cm) Thai. Muerzhableke dominated the action all the way with Chaloemporn gutsily trying to match punches but being ground down. Muerzhableke floored the Thai in the third and twice more in the fifth with the referee finally stepping in to save Chaloemporn in the sixth. 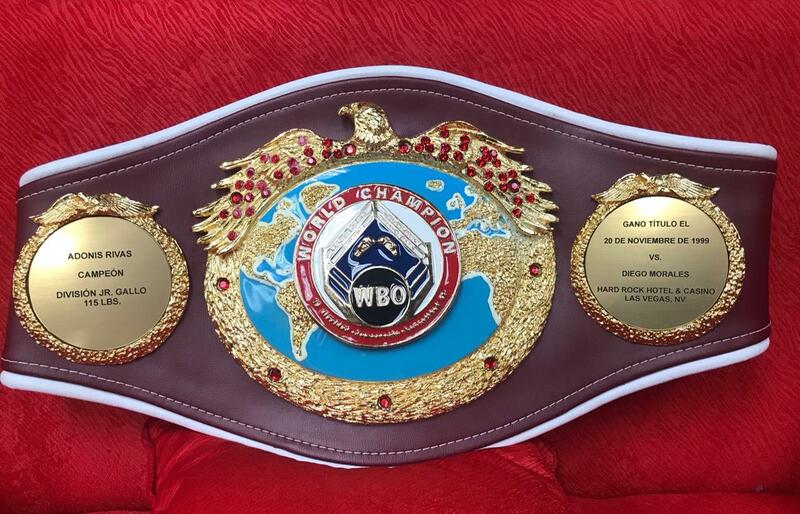 Muerzhableke wins something labelled as the vacant WBO China National title. Muerzhableke’s record does not stand up well. He started out 2-1-1 with the loss and draw being against fighters with only two fights between them. He then won five in a row over four opponents who had never previously had a fight and one who was 0-5! Chaloemporn has now lost 6 of his last 7 fights with all six losses by KO/TKO. Tokyo, Japan: Super Welter: Akinori Watanabe (37-7) W TKO 1 Ryosuke Maruki (15-6-1). Minimumweight: Shin Ono (23-9-3) W TKO 8 Riku Kano (13-4-1). Southpaw Watanabe brushes aside Maruki to win the vacant interim Japanese title. Maruki scored early with a series of rights but Watanabe then landed a big right hook and opened a cut over the left eye of Maruki. Watanabe drove Maruki to a corner and landed heavily to head and body sending Maruki down. He beat the count but was backed into a corner again and taking punishment when the referee stopped the fight. The 33-year-old Watanabe is a former Japanese and OPBF champion who now has 31 wins by KO/TKO. At one time he had a run of 15 consecutive wins by KO/TKO which I believe might be a Japanese record. He is a former All Japan Rookie King and his reward for winning the competition was a sparring session with Floyd Mayweather Jr. This win here was important to him as his three-year-old daughter is in hospital battling against leukaemia and he wanted to win it for her. Maruki was making a third try at a national title having lost in two previous attempts and as a testament to Watanabe’s power this is Maruki’s first loss by KO/TKO. Ono retains the Japanese title with stoppage of youngster Kano. Although both are southpaws their styles are completely different. The champion is a hustler and bustler and Kano a more correct boxer. Ono outworked Kano in the first and Kano outboxed Ono in the second but the champion landed well to the body in the third and fourth. The fifth was the best round so far as they both scored well. After five rounds two of the judges had it 49-46 for Ono and the third had Kano in front 48-47.Kano had a good sixth and opened a bad cut over the left eye of Ono but Ono’s team did some good work and Ono took the seventh even though the cut opened again. Ono was turning the fight into a brawl and in the eighth they clashed heads. Kano came off worst. He went to the floor and seemed very rocky. He got up and was taken to a neutral corner for some recovery time but immediately the fight restarted Ono floored the challenger with a cluster of punches. Kono managed to get up but was put down again and the fight was over. The 35-year-old Ono has had two world title shots losing to Katsunari Takayama for the IBF minimumweight and CP-Freshmart for the WBA version of the same title. He is currently rated WBO 9/IBF 12(11) so has an outside chance of another shot. Kano, 20, lost to Takayama for the vacant WBO title in 2016 and he is young enough to challenge again. Glendale, AZ, USA: Feather: Francisco De Vaca (19-0) W PTS 8 Jesus Serrano (17-6-2,1ND). Super Feather: Robinson Conceicao (9-0) W PTS 8 Edgar Cantu (7-5-2). Light Heavy: Trevor McCumby (24-0,1ND) W TKO 3 Jessie Nicklow (27-9-3). Super Light: Arnold Barboza Jr (19-0) W TKO 5 Luis Solis (24-9-4). Light: Antonio Lozada Jr (40-2-1) DREW 8 Hector Ambriz (12-7-2). Super Bantam: Carlos Castro (21-0) W PTS 8 Diuhi Olguin (13-11-3). De Vaca beats Serrano in a tough close-quarters battle. Both fighters just stayed in the pocket and swapped punches. Neither wanted to back up and they were both working inside with very little clinching. De Vaca was doing the better work with flashing combinations and just outworking Serrano. De Vaca also profited from a questionable knockdown in the fourth but was a worthy winner. Scores 78-73 twice and 79-72 all for De Vaca. The result was right but the scores do not reflect how hard De Vaca had to fight to win this one. The 23-year-old Mexican De Vaca now lives in Phoenix and is being sensibly matched against some experienced opponents. In a lovely gesture when he turned pro at 18 he donated his first pay check to support breast cancer research as three of his aunts have suffered from cancer. Serrano put together a run of nine wins before the streak was broken by a loss to Hector Tanajara in November. He was halted in two rounds by Avery Sparrow in March but the result was changed to a No Decision when Sparrow tested positive for a banned substance and Sparrow in still No 13 in the WBO ratings. Brazilian Conceicao seems to finally be settling in as a pro, in the past he had been a bit wild as if trying too hard to prove himself. He boxed more this time and managed to get eight rounds of good experience under his belt. He had height and reach over Texan Cantu and used those advantages to rake Cantu with sharp accurate jabs. He was also scoring with some slashing body punches. He floored Cantu with a right in the sixth but did not press too hard looking as if he mainly wanted to go eight rounds as he never been past six before. Scores 80-71 for Conceicao on all three cards. At 29 Rio gold medallist Conceicao needs to progress quickly and probably needs a couple more eight rounds fights before going up to ten. Cantu has lost four in a row all to unbeaten fighters. McCumby returns to action with stoppage of Nicklow. After 21 months out of the ring McCumby took a little while to shake the rust and go to work. He cut loose in earnest at the start of the third and had Nicklow in deep trouble from a heavy right with the referee stopping the fight at that point over the protests from Nicklow. McCumby’s absence was due to a suspension arising from a positive test for banned substances after his one round win over Donovan George in November 2016. The 25-year-old fighting in his home town makes it 19 wins by KO/TKO. Nicklow has mixed in good company taking Ryota Murata the full ten rounds and losing over eight to Ron Gavril. Barboza gets stoppage win over Solis to remain undefeated. Barboza never allowed Solis a chance in this one. Solis had no answer to the power and accuracy of Barboza’s jab. Barboza mixed in some good bodywork but the key element was the damage that Barboza’s jab was doing to Solis. By the fourth Solis was having difficulty seeing out of his right eye and at the end of the fifth the ringside physician ruled it was too dangerous for Solis to continue and the fight was over. Barboza, 26, shows real promise and was coming off an impressive win over 23-1 Mike Reed in his first ten round fight. Solis was a very live opponent having won 8 of his last 9 fights including victories over former IBF champion Cristobal Cruz and experienced Nery Saguilan. This one was just supposed to be a keep busy win for Lozada but Ambriz had other ideas and earned a draw. It was a very close fight over the opening rounds with Ambriz probably just doing enough to get a slim lead. Lozada’s greater experience saw him pick up the pace over the late rounds and he seemed to have just done enough to take the decision but the judges did not all agree. Scores 78-74 for Lozada, 79-73 for Ambriz and 76-76. Lozada scored a big win in March when he stopped previously unbeaten Felix Verdejo and was poised for some big matches so he did well to avoid a banana skin here. Ambriz, 22, put together a nice run of seven wins but is now 0-1-3 in his last four but has taken unbeaten Hector Tanajara and world rated Denis Shafikov the distance. Fighting in his home State Castro makes it 20 wins as he takes a unanimous decision over Olguin. Castro turned in a flawless performance showing good hand speed, plenty of intelligent movement and sharp combinations. Olguin kept pressing and showed good punch resistance but he only rarely managed to pin Castro down. The scores were 80-72 and 79-73 and a very strange 77-75 which looked far too close. The 24-year-old Castro has useful wins over Juan Palacios and Alex Santiago. He was born in Mexico but moved to Arizona as a child. Yet another good prospect in the Top Rank team. Now 5 losses in his last 6 fights for Olguin but he has a win over Horacio Garcia who gave Carl Frampton a good fight and in May beat the 14-1 Kevin Rivers. Kinshasa, DRC, Cruiser: Ilunga Makabu (22-2) W RTD 4 Taylor Mabika (19-2-1). Super Light: Tshibangu Kayembe (9-03) W RTD 1 Cosmas Cheka (22-12-5).Welter: Eric Kapia Mukadi (22-2-2,1ND) W PTS 12 Salehe Mkalekwa TBA ( ). Makabu gets a rare chance to fight in his home country and wins the vacant WBC International title with victory over Taylor. Makabu was on the front foot for the whole of the fight. Taylor boxed intelligently trying to keep away from the powerful southpaw lefts of Makabu and firing quick counters when he got the chance. Makabu began to find the range with straight lefts and hooks and finally landed a thudding shot in the fourth that put Taylor down. Taylor make it to the bell but had injured his right shoulder and retired. The 30-year-old South African-based Makabu is rarely in a distance fight as he has now won 21 by KO/TKO and his two losses have come inside the distance. He is No 9 with the WBC and hoping to fight his way back to a title shot having had Tony Bellew on the floor before losing to him for the vacant WBC title in 2016. French-based Taylor, 39, showed good skills here. He was 10-01 going into this one and his three losses have all been to world rated fighters. Kayembe gets unusual win as Cheka retires with a cramped right leg after just one round. Cheka had been dancing throughout the first round covering the ring perimeter with Kayembe following him but rarely able to land a punch. Cheka did not come out for the second and was in some pain. Local fighter Kayembe wins the vacant UBO International title. Just bad luck on Tanzanian Cheka. Congolese fighter Mukadi wins the vacant ABU welter title with points win over Tanzanian Mkalekwa. It was a well contested fight but Mukadi had the better skills, He scored with quick accurate punches and dodged or smothered the wild attacks of Mkalekwa. The tall Mukadi is based in South Africa and his losses have been to world rated Thulani Mbenge and former South African champion Shaun Ness. Struer, Denmark: Feather: Dennis Ceylan (19-2-2) W PTS 8 Levan Tsiklauri (10-4-1). After a technical draw and two losses Ceylan needed a win to steady the ship and he achieved that here. The skill gap was considerable and Ceylan also had height and reach on his side but Georgian Tsiklauri put in a good effort and made Ceylan fight hard. The Dane has worked on his defence since those two losses but still has some way to go to get back to form he showed two or three year back. He landed some excellent counters and seemed to be going for the finish in the seventh but was rocked himself in the same round and under pressure from the wild attacks of Tsiklauri. Scores 80-72, 79-73 and 78-74 for Ceylan. After losing his European title to Josh Warrington Ceylan suffered a bad defeat being knocked out in two rounds by the 8-1 Spanish champion Jesus Sanchez. That has pushed him right down to No 12 with the EBU so he has a lot of rebuilding to do. Tsiklauri is 0-4-1 in fights outside Georgia. Mexico City, Mexico: Middle: Ramon Alvarez (27-6-3,1ND) W PTS 10 Nicolas Luques (10-5). Alvarez makes it three wins in a row as he takes unanimous decision over inexperienced Argentinian Luques. Alvarez looked on his way to an easy night as he floored Luques early. After taking the first round Alvarez scored with some powerful combinations in the second which had the referee poised to jump to the Argentinian’s rescue. Luques survived but a right floored him in the third. He beat the count and despite some ferocious attacks from Alvarez he was still there at the bell. Slowly Luques worked his way into the fight. Her matched Alvarez in the exchanges and opened a cut on the left eyebrow of the Mexican in the eighth. Alvarez found a second wind and finished strongly to take the decision. Scores 98-91, 97-92 and 96-93 all for Alvarez. The 32-year-old “Inocente is the elder brother of Saul. He has been an inconsistent fighter winning and losing against Omar Chavez, losing to Antonio Margarito and beating Vivian Harris and Jorge Paez Jr. Luques really just a prelim fighter but he had won his last three fights. Managua, Nicaragua: Light: Freddy Fonseca (24-2-1,1ND) W TKO 1 Eliecer Lanzas (17-4-3). Fonseca gets this one over inside three minutes. After some cautious jabbing by both boxers southpaw Fonseca started scoring with some long lefts. As they came together in mid ring Fonseca landed a thunderbolt-like left hook and Lanzas went down like a tree falling ending up flat on his back and the referee immediately stopped the fight without a count. Lanzas took quite a while to recover from the fierce punch. The 26-year-old Costa Rican southpaw is now 13-0,1ND in his last 14 fights and this is his fifth win in a row by KO/TKO. He had stopped Lanzas in five rounds in November. Nicaraguan Lanzas is 1-7 in his last 8 fights with six of the losses by KO/TKO. Buenos Aires, Argentina: Cruiser: Olan Durodola (27-6) W Jackson Junior (21-10,1ND). Durodola pops up in Argentina and blows away Brazilian Junior inside two rounds. The 37-year-old Nigerian is now 1-2 in fights this year having lost to Maksim Vlasov and Krzys Wlodarczyk. Eighth loss by KO/TKO for Junior. Villa Carlos Paz, Argentina: Feather: Alan Luques (26-7) W PTS 12 Esteban Stodulski (7-9-3,1ND).Cruiser: Yamil Peralta (1-0) W KO 3 Ivan Cisneros (0-1). Luques keeps the South American title as he outboxes and outscores former victim Stodulski. Luques was more mobile and more accurate with his punches. His jab was his main weapon and although Stodulski kept piling forward he was never really in the fight. They shared the first two rounds but then Luques swept every round until the eighth when Stodulski managed to land some good body shots. From the ninth to the end of the fight Luques was in control and ended a clear winner. Scores 118-112 ½ ,118 ½- 113, 118 ½ -114 ½. Luques was defending the South American title for the third time. He is the Argentinian No 1 and is 7-1 in his last 8 fights with the loss being a points decision against Diego De La Hoya in July last year. When he fought Stodulski in April Luques only just scraped through with a split decision. Stodulski is now 2-3-1 in his last 6 fights. Double-Olympian Peralta turns pro with kayo of Cisneros. Peralta used a strong jab and some hefty overhand rights to take control of the fight from the first. Cisneros did not have the power to compete and the action was one-sided before Peralta ended the fight in the third with a solid left to the body that put Cisneros down and he was counted out. The 27-year-old 6’3 ½” (192cm) Peralta represented Argentina at both the 2012 and 2016 Olympics. He won a bronze medal at both the World Championships and Pan American Games and gold at the South American Games as well as competing in the AIBA pro tournaments for the Argentinian Condors. So worth watching. First pro fight for Cisneros. Buenos Aires, Argentina: Super Bantam: Javier Chacon (26-4-1) W TKO 10 Claudio Echegaray (21-2-1). Chacon chases and harries Echegaray before stopping him in the tenth round. Southpaw Echegaray had lots of height and reach over Chacon who started his career as a flyweight and Echegaray was able to box his way through the first two rounds. From the third Chacon was storming forward, getting past the jab and scoring with hefty shots to head and body. Echegaray continued to try to keep the fight on the outside but there was no power in his jab and Chacon kept pinning him to the ropes and landing with strong rights. In the eighth Chacon had Echegaray on the ropes and was scoring with both hands and the referee stepped in and gave Echegaray a standing count. Echegaray made it though the ninth but in the tenth with Echegaray again against the ropes Chacon landed a left to the head and a right to the body. Echegaray slumped back into the ropes defenceless and as the referee came in to save him Echegaray dropped through the ropes to be sitting on the ring apron. Chacon has had a good career but has lost the big fights. He was outpointed by Anselmo Moreno for the WBA bantam title in 2014, stopped by Jamie McDonnell for the secondary WBA bantam title in the same year and beaten in six rounds by Isaac Dogboe in July last year. After being 21-0-1 it is now two losses in a row for Echegaray. Lugogo, Uganda: Cruiser: Joey Vegas (21-16-3) W RTD 5 Karama Nyilawila (25-19-3). Super Welter: Muhamad Sebyala (18-11-1) W TKO 1 Omari Ramadan (15-2-2). Vegas (real name Lubega) wins the UBO world title with victory over Tanzanian Nyilawila. Vegas was going to the body in the first and put Nyilawila down with a left hook. Nyilawila beat the count but had to sustain more punishment in the second and third. Vegas put Nyilawila down with another left hook in the fourth. Nyilawila survived into the fifth but was put on the floor for a third time this knockdown from a right hook. That was enough and Nyilawila retired. The 36-year-old Ugandan gets win No 14 by KO/TKO. Vegas turned pro in Britain but has boxed in many different countries since then against top level opposition. As Joseph Lubega he was Captain of the Ugandan boxing team and won a silver medal at the Commonwealth Games and competed at the 2004 Olympics. Southpaw Nyilawila has 11 losses by KO/TKO. One to watch: Plenty to choose from but I will go with Ruben Villa 13-0 and save the others for later.